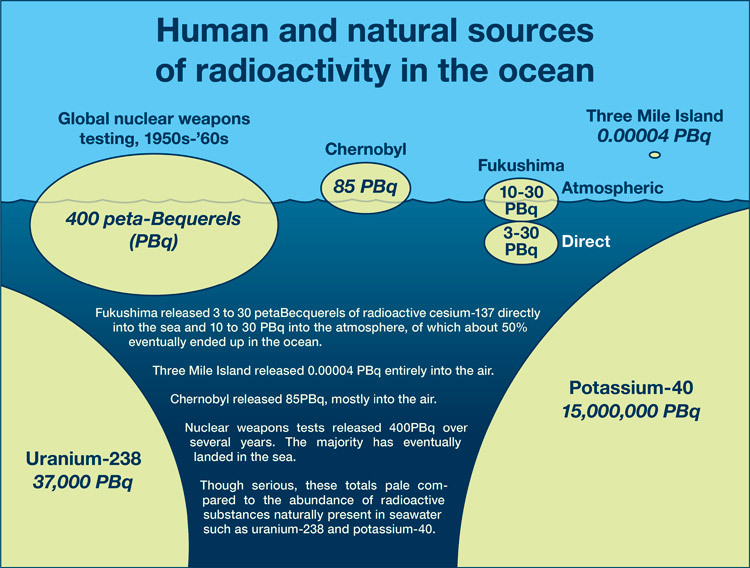 There is a broad consensus among the scientific community that ocean-borne radiation from the Fukushima nuclear reactor does not pose a significant risk to humans in British Columbia, relative to other environmental risks. Recent (2016) and on-going studies by Dr. Jay Cullen of UVic posted on his project site InFORM and reports from similar WHOI studies along the west coast of the U.S. indicate the amount of tracable material reaching North America is small. Nevertheless, many people are concerned about what they have heard from various other sources. Illustration by Jack Cook, courtesy of the Coastal Ocean Institute, Woods Hole Oceanographic Institution. “Based on the monitoring of fish and seafood that has taken place since the Fukushima accident, it is very unlikely that someone in North America would consume local seafood that contains either [Cesium as] Cs-134 or Cs-137. In 2011 and 2012, the Canadian Food Inspection Agency tested domestic fish from B.C. for radioactivity. Neither Cs-134 nor Cs-137 was detected in any of the 32 fish samples. The Canadian Albacore Tuna Association has also tested B.C. tuna samples collected between 2010 and 2012 and detected no cesium. In August 2011, levels that were roughly 300 times lower than levels that would prompt further U.S. Food and Drug Administration investigation were detected in Pacific Bluefin tuna caught off the coast of California. Dr. Jay Cullen's InFORM project, dedicated to monitoring conditions along the BC coast.